It’s no secret that getting exercise is an important way to keep us healthy and fit. Even so, sometimes it’s hard for us to find a way to add exercising into our busy schedules. Videogames and television and other sedentary activities compete for our attention and our time. We want our free time to be spent having fun, but some kids don’t realizing just how much fun exercising can be. Check out the inspiring story of our August Amazing Kid! of the Month, 1 Amiya Alexander, and see how Amiya has found a way to make it both easy and fun for kids in her community to get exercise, and in a really creative way! Amiya’s passion for dance, teaching and helping others has been a huge inspiration to Amiya and is the secret ingredient that fuels her and her “dance-business-in-a-bus!” Amiya’s passion for dance has helped her to “dream big,” and accordingly, she has set a BIG goal for herself: to help get every child in America active. Talk about amazing! Read more about Amiya and all of her success, and maybe you too will be inspired to open your own active kids business, or at the very least, it may inspire you to get out and start dancing! Don’t forget: If you, or a young person (or persons!) you know, has an amazing project you are involved in, or a special skill, talent or ability you want to tell the world about, be sure to let Amazing Kids! know about it! Simply complete our Amazing Kids! of the Month award online nomination form, visit our AKOM nomination information page or email us! Not many kids can say that they own their own bus, much less their own business. But Amiya Alexander owns both and it’s obvious this amazing kid knows just how to get her amazing dreams off the ground. 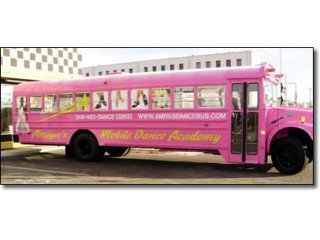 Just two years ago, when Amiya was 9 years old, she had a dream to open her own dance studio inside a bus, but not just any bus–a pink bus! “On September 6th, at about 1:06 in the morning, I had a dream, and I ran to Mom, and said ‘Mom! Mom! Wake up! I have an idea,’” Amiya explains. She had dreamt about a pink bus where she taught dance lessons to others. At first Amiya’s mother was reluctant, but after a little more arm pulling on Amiya’s part, she gave in. “She woke up and helped me write a business plan and told me to sketch the bus,” Amiya says. That Christmas Amiya’s mother would surprise Amiya with her own pink bus. 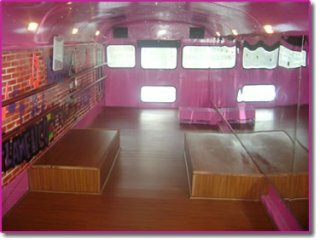 Taking out all but a few seats and decorating it, the bus was transformed into a dance studio. Amiya’s Mobile Dance Academy was open for business! Sending out flyers to schools and childcare centers, Amiya has attracted a following of students starting as young as 2 years old! Her bus is decked out with sound system and dance floor. Amiya also brings the bus around for birthday parties and other events. Driven by her great uncle, the bus travels all around the city providing lessons: Ballet, Tap, Jazz, Hip Hop, Salsa, and much more! 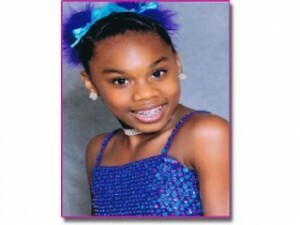 Amiya’s dream goes much farther than just opening her own dance studio. “I want to help children who can’t afford dance lessons and teach them how to dance,” she says. Dance lessons can be expensive and Amiya wanted to make sure all her friends could afford it and have the opportunity to learn. Lessons cost as low as $11.50 for a one hour class. The ultimate goal of Amiya and her bus dance academy is to fight childhood obesity, which is a growing epidemic in the United States. Currently, childhood obesity effects about 1/3 of American children. Amiya’s goal is to bring that number down to zero by getting kids to eat right and work out. How cool is that?! While Amiya recognizes that there are too many bad role models for kids in todays’ media, with so many kid and youth celebrities acting irresponsibly, Amiya’s goal is to spread a more positive message: “Every child deserves a chance to grow and become a positive person,” she explains on her website. Amiya’s own inspiring story of owning and maintaining a successful business at such a young age is a great example for other kids to learn from and become inspired by! Amiya didn’t start out this successful, but has built her way up through the years. “ It takes a lot of hard work to start your own business,” she explains. “You can’t start it and one day say, ‘Well, not a lot of people believe in me, so I’m going to quit.’” Amiya’s biggest help along the way has come from her mother: “It was mostly my mom who helped me,” Amiya admits. But the help didn’t just stop with buying the bus. Lots of legal work went into the business. And Amiya, along with her mother and others on her “Dream Team” who supported her, were there every step of the way making her dreams come true! So what does the future hold for Amiya? Amiya would like to own a franchise. Along with her bus she would like to have a whole performing arts center! Finally, she adds: “I would also like to go to Harvard Medical School.” She would like to someday become an obstetrician and work alongside her mother who is a registered nurse. With such a remarkable foundation already in place, we at Amazing Kids! have no doubts that Amiya can accomplish anything she puts her mind to! Get active and stay healthy! To learn more about how kids and teens get active and stay healthy, check out KidsHealth.org. They have a section just for kids, for teens and for parents too. KidsHealth is the winner of four Webby Awards, including for Best Family/Parenting Site and Best Health Site on the Web, as well as the Parent’s Choice Gold Award, the Teacher’s Choice Award for Family, and the International Pirelli Award for best educational media for students.